After much time spent testing, researching and reviewing, Artifact Outfitters has determined the Best Ground Blinds for Deer Hunting. Starting with the Best of the Best Ground Blinds for Deer Hunting, all blinds listed here are the best in their price range. As with most hunting gear, you get what you pay for, so go with the best you can afford. Please go through the links on this page before buying any ground blinds we recommend to ensure you get the best price possible and so we get credit for sending you. Thank You! The Dark Horse Ground Blind by Double Bull is hands down the best ground blind for deer hunting. The decision to put the Dark Horse as the #1best ground blind for deer hunting did not take long. As soon as I inspected it at the store I could tell that it was made out of much better materials and components then any of the others that were set up; even compared to blinds in the same price range. Forums and customer reviews confirmed my suspicions as the Double Bull Dark Horse Ground Blind is definitely the most talked about and highly rated by the people who own them. Most customer reviews said they love theirs, many of which said they will never go back to an inferior ground blind as they are spoiled now that they have used a Dark Hose. There are several things that make the Primos Double Bull Dark Horse the best ground blind for deer hunting. First of all, and the first thing you will notice is that everything about it is high quality. It is obvious that the people who engineered this ground blind are hunters who really know what design is needed for the most optimal window placement, size and shape. The front window offers 180 degrees of shooting and can be silently adjusted from 0-20 inches. There are also several shooting windows on the back sides so you can shoot no matter where the buck of a lifetime shows up. Shoot through mesh keeps you well hidden through all windows. The Dark Horse offers 360 degrees of shooting opportunity. 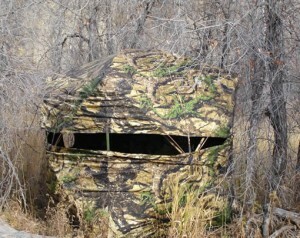 You will also have a hard time finding a ground blind that sets up as quickly and quietly as the Dark Horse. After a little practice and break-in time, you can have it set up in place in under 10 seconds. Then with dimensions of 78″ x 78″ x 67″H, there is plenty of room for more than one person. I must say, the camo pattern is a little strange when you look at it closely, but even it is well though out as when it is in the field, it does a great job blending into the environment; check out the pictures. There are several other items that make this the best ground blind for deer hunting, but I will let you read about them at the links listed below. 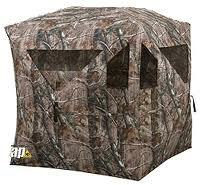 The only thing that I am not a fan of with this ground blind is the price. It is more expensive than most, but the price is justified when compared to the competition. You get what you pay for, so If you are looking for the best ground blind for deer hunting, then there is no doubt the Double Bull Dark Horse is it. You will see that I am not the only person who thinks this by reading the customer reviews at the links below. The Escape Deluxe Ground Blind is a good all round ground blind for anywhere and anything. It has received near perfect customer reviews. You will not find any ground blinds for deer hunting that have the amount of view, room, and good reviews as the Escaped Deluxe Blind by Primos has. It has 12 large, detachable windows and shoot through mesh that are perfect for both firearm and bow shooting, and allow you to control the amount of view you want and where the light shines in, if any. To add concealment, the Phantom Pro black interior reduces the amount of game spooking shadows inside this deer hunting ground blind. Perhaps one of the best things about the Escape Deluxe Ground Blind is the fact that it is quite possibly the easiest to set up ground blind for deer hunting on the market. It does so with a cable-engineered hub system where all you do is pull out the hub to raise and push it in to collapse, keeping noise and disturbance to a minimum with minimal in the field set up. You also have the ability to set it up wherever you please as the camo pattern blends in to both a field atmosphere or tucked back in the woods. The Camo pattern on the Escape Ground Blind is great for open and forested areas, making this a great all-round hunting blind. The Deluxe in the name fits well as this ground blind for deer hunting is very roomy at 77″W x 77L x 75″H that allows a sitting or standing shooting position, and plenty of room for another person and their equipment and video camera. It also includes two storage compartments to keep your deer hunting gear organized and ready when you need it. Again, I will let you read the rest of the specs at the links below. Be sure to read the reviews at Cabelas.com and Amazon.com, as you won’t find many ground blinds for deer hunting with the type of rating the escape has. This is the best value ground blind on the market regardless of what animal you are hunting. The Ameristep Brickhouse is one of the sturdiest ground blinds for deer hunting on the market. Built sturdy as the name would imply, this deer hunting ground blind keeps in mind that not all hunting conditions are alike, and conditions can be harsh at times. To combat wind, ground stakes and high-wind tie downs are included to really cinch her down, and the blind is constructed with a rugged Hub-Wall design with the exterior being made out of Durashell Fabric. All this to ensure that your ground blind is ready for deer hunting when you get to it. 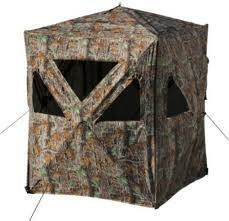 Not only is the Brickhouse built tougher than ground blinds twice the price, it is also very affordable at about $100. 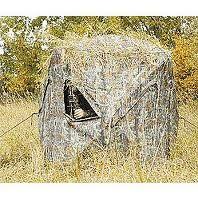 The Ameristep Brickhouse is an excellent ground blind for deer hunting not only because it is built tough. It is also incredibly quick to set up and take down, is light weight (18 lbs), packs into a back pack, and is plenty roomy for more than one person at 75″ X 75″ X 67″H. Different stores offer different camo patterns so check all links below and choose the one which matches your deer hunting habitat best (both patterns will work in most locations, so price might be more important to you, as all stores price this ground blind differently). The inside of this deer hunting ground blind is lined with a carbon-enhanced fabric that not only conceals movement from within the blind, but also works to cut down on scent that leaves the confines of the Brickhouse. Also provided are shoot through mesh windows that help immensely to keep you hidden from both the deer, elk, antelope or turkey, and whatever else you may hunt out of it, and also the bugs that can distract from the task at hand: Hunting in Comfort. 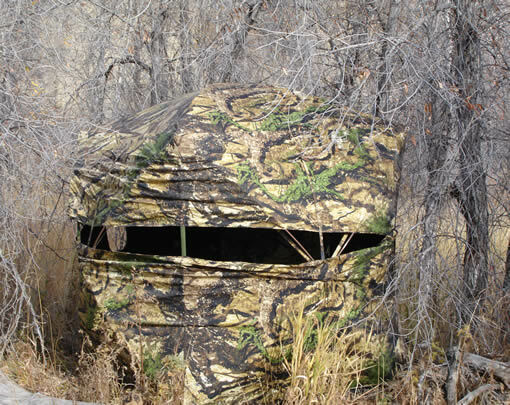 The Ameristep Doghouse Ground Blind is lightweight, versatile, sturdy and inexpensive . 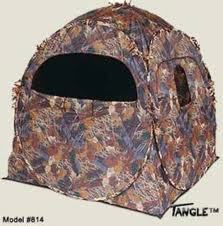 Although it is inexpensive, the Ameristep Doghouse is definitely a worthy ground blind for deer hunting. 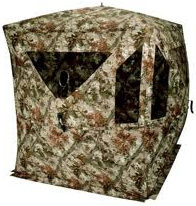 This doghouse style blind will keep you concealed, dry, and comfortable while hunting any game, and will not require a lot of effort getting it to your favorite hunting spot as it weighs a mere 14 pounds. Of course to keep the weight and cost down, this ground blind is smaller than the ones featured above, but still offers enough room for two people and their weapons without requiring any cuddling; it measures 60″ x 60″ x 68″H making it the tallest of the best ground blinds for hunting. The Doghouse Ground Blind has four windows and three port holes and is good for any type of deer hunting whether it be with a firearm or bow. The windows are equipped with shoot through mesh and tie downs to give you plenty of concealment while providing you with ample shooting lanes. Quite possibly the easiest ground blind to set up. This ground blind is also built tough. It is made out of Durashell Fabric which is very strong and water resistant. Included is also ground stakes and high wind tie downs to keep it on place This fabric will also hold its color for a long time even when exposed to months of direct sun light. The dome shape design allows for optimal strength as well as easy set up and take down. Ground Blinds have become increasingly popular over the last few years for all types of hunting. Versatile, light, inexpensive and mobile are all reasons for the increase of their popularity. Perhaps the biggest reason for the rise in popularity of ground blinds is the fact that they provide an unmatched level of comfort while deer hunting and any other game animal as you can stay warm and dry and sit in a comfortable seat. Why are ground blinds so effective for deer hunting? Concealment: When sitting in a ground blind, deer and other animals do not realize there is a person sitting inside the blind, so they will approach a ground blind as if it were just another tree in the forest; especially if the ground blind has been in place for some time so that the deer can become accustomed to it. This gives a deer hunter the advantage and if patient enough, the opportunity to get a shot at a deer from close range. Scent Retention: Being inside of a ground blind while deer hunting keeps a large part of your scent from leaving the blind. The sense of smell is the number one sense deer have to protect themselves from predators. Humans are the stinkiest smelling predators a deer has to deal with, and is just one molecule of human scent is detected, any deer will be on high alert. The smartest bucks typically smell hunters before they are ever seen and are gone before the hunter ever knew they were there. That is why it is so important to keep your smell to a minimum, and ground blinds can help. Mobility: Ground blinds offer a deer hunter the ability to set up wherever and whenever they want enabling them to move at a moments notice to get in a better spot. It seems like when you set up or build a tree stand you wish you would have set it up 100 yards away where you keep seeing the deer. 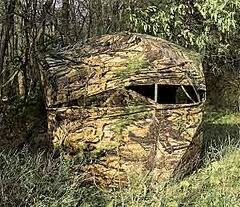 With a good ground blind, you can move it and be hunting there right away. Of course there is a lot to be said about keeping a ground blind in the same spot so deer can get use to it, but in some cases you have to be aggressive and go to the deer. Comfort: I must stress the comfort level that a ground blind for deer hunting can provide again. The fact that you can sit for increased periods of time regardless of weather conditions is a huge benefit that ground blinds can give a deer hunter. The more time spent hunting the better the chances of a buck of a lifetime will show up. There are many things you can do to improve your the effectiveness of your deer hunting out of a ground blind. Here are a few tips that you can use to help seal the deal on a deer this hunting season. The number one variable you need to address when ground blind hunting for deer is location. You want to place that ground blind in an area that is frequently visited by deer, and more importantly big mature bucks (if that is what you are after). There are several ways to predict if there are deer in the area. The easiest was to tell is to view the area in the mornings and evenings. If there are a lot of deer in the area, then you will at least see a few. Another good way is to look for sign. Deer tracks and droppings can tell you alot about how many deer are in the area. More importantly, deer sign can give you a good idea of the size of the deer and the directions they are heading. Perhaps the most effective way to scout the location is to set up trail cameras. That way you know exactly what type of deer are in the area and allow you to know when they are moving. This way you can select the exact buck you plan to hold out for. It is best to get your scouting done and set your blind up before the season so by the time the actual season opens, you will be ready and the deer will have become accustomed to the ground blind. The more time you are in your stand the better the chance is of you being there when the deer you are after comes by. This might not take long if you are only after a young buck or a doe, but to get the big mature bucks, you may have to be patient and be able to pass up lesser deer in hopes that the buck of a life time will come along. While there is a lot to the processes listed above, once you are in a good spot that you know the deer you are after frequent oftenly and you have the blind set up, then all you have to do is show up and hunt in comfort.